Even the cat is tolerating him! 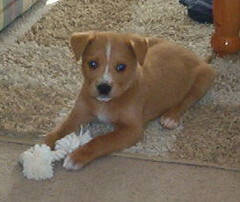 One caveat: watch your yarn around your pup. 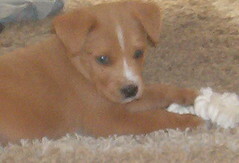 I can't *tell* you how much Jasper loves to gnaw on my yarn! I've gotten lots of untangling practice because of him. I hope your pup will be different. Jasper's one of those got-to-have-someting-in-my-mouth-at-all-times dogs. What a cutie! And he is so small compared to the kitty. awe!! 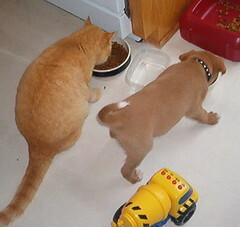 My cat would never eat next to a puppy LOL... we are getting a golden girl puppy on monday! I can't wait, and I I have fabric arriving about the same time but I don't think I will get to work on to much craft stuff lol. SUCH A CUTIE!